Or more particularly let’s talk about how retirement villages don’t pay much tax. Your correspondent has just returned from Auckland having: topped up her CPD hours; seen old friends and talked with tax peeps. And in that short period while I was away another industry was outed as being non-taxpaying. Now it is retirement villages and they aren’t even foreign. But don’t panic. 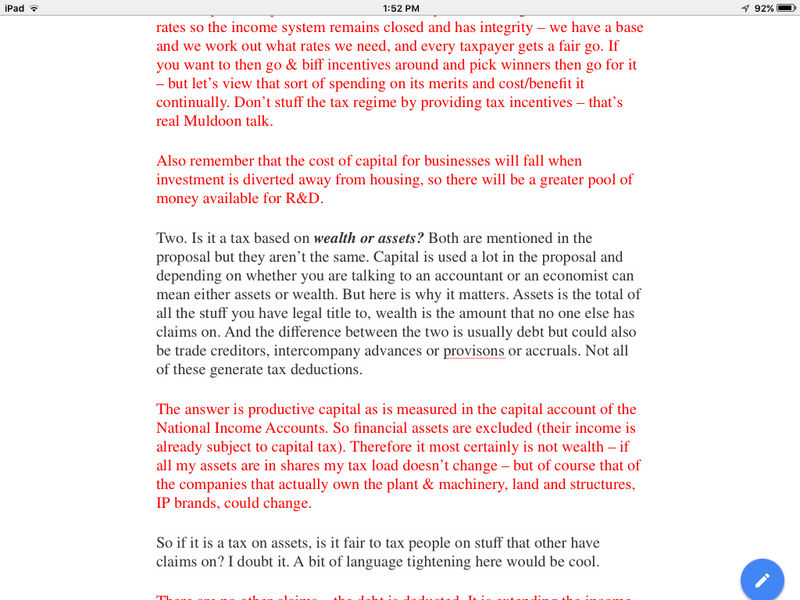 Steven Joyce says Inland Revenue is reviewing sectors of the economy which has low tax to accounting profits. And if there is a policy problem it can be put on the policy work programme. Phew. Now as I have 5 days to complete 3 major pieces of assessment from my yoga course I have had two months to do – the sensible thing would be to put this issue down and pick it up after I have done my assessment. Coz it is not like they about to start taxpaying anytime soon. But the issue is really interesting. I am sure 4 days is enough to do all that other work. And I do need breaks from all that right brained stuff. I mean isn’t yoga all about balance? So let’s have a look at the public stuff dear readers and see if we can’t unpick why these lovely people – much like our multinational friends – aren’t major contributors to the fisc. Now I know there are a few different operators but I thought I’d have a look at Ryman. Who may or may not be representative of the rest of them. Now their tax stuff is interesting. Accounting tax expense of $3.9 million on an accounting profit of $305 million. But accounting tax expense is a total distraction if you want to know how much tax is actually paid. Why? Different rules. Future post I think. Next place to look – imputation account which increased by $37,000. That can be real tax but can also include imputation credits from dividends received. So close but no cigar. And then there is the oblique reference in note 4 to their tax losses in New Zealand having increased from $2.5 million in 2015 to $17.9 million in 2016. Bingo! That looks like they made a tax loss of $15 million in 2016 when they made an accounting profit of $305 million. Nice work if you can get it. Ok now before we get into some exciting detail let’s have a think about what these retirement villages actually do. They can provide hospital services; some provide cafeterias; and they generally keep the place maintained. But mostly they ‘sell’ lifetime rights to apartments and flats on their premises. And it is this lifetime rights/apartment thing that is – in your correspondents view – the most interesting. Looking at Ryman’s accounts and marketing material the deal seems to be residents provide an occupancy advance and get to have undisturbed use of an apartment until they ‘leave’. On ‘departure’ the right will be ‘resold’ and the former resident gets back wot they paid less some fees. So the retirement village gets the benefit of any capital gain on the apartment as well as the benefit of forgone interest payable on the advance. All comparable to a ‘normal’ landlord who would receive the benefit of rent and capital gain on their property. And like a ‘normal’ landlord they don’t really know how long the resident or tenant will want to stay. It could be one day or 30 years. But economically this doesn’t matter as the longer the resident stays the less in NPV terms the retirement village has to pay back. So whether landlord gets rent or repayable occupancy advance they both give the same outcome pretax and pre accounting rules. That is with rent over a long period you get lots of rent; with interest free occupancy advances over a long period you get lots of not having to pay interest. However this isn’t how it pans out for accounting or tax. For accounting the advances are carried at full value because they could be called immediately – occupancy advances in section j of Significant Accounting Policies. And because of this there is no time value of money benefit ever turning up in the Profit and Loss account – or what ever it is called now. Unlike rent which would get booked to the P&L when it was earned. And tax is equally interesting. The Ryman gig seems to be that for the occupancy advance the resident gets title under the Unit Titles Act and a first mortgage for the period they are in the property. Fabulous. Unfortunately your correspondent is about as far away from a property lawyer as it comes. But according to my property law advisor Wikipedia; a leasehold estate is where a person holds a temporary right to occupy land. Kinda looks like what is happening here. So that would be taxable under the land provisons. And even if it isn’t taxable there – to your correspondent – it looks pretty taxable as business income. But in either case that involves taxing the entire advance and not just the interest benefit. Seems a bit mean. True. But let’s look at deductions before we call meanness. Tax deductions are allowed when expenses are incurred or legally committed to. Not when actually paid. So if you are a yoga teacher and you commit to a Tiffany Cruikshank course in Cadiz in May 2017 – she is here in Wellington ATM so exciting – paying the USD 500 deposit in April 2016 you can take a deduction for the full amount of USD 2790 in the 2016/17 tax year. 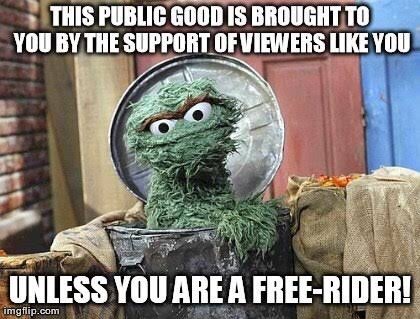 Even though you don’t pay it until closer to the actual course. Tax geeks yeah I am talking about Mitsubshi. So for our retirement village friends as they are committed to repaying the occupancy advance in the future on the day they receive it. Immediate deductibility which cancels any taxable income. Mmm. Tbf though the tax act isn’t big on the whole time value of money thing. The exception is the financial arrangement rules where embedded interest can be spread over the term of the loan. And there is even a specific determination that deals with retirement villages. Now that seems to have more bells and whistles than is obvious from Ryman’s accounts so not entirely sure it relates to them. But there is one bit that could apply as the determination does say that the repayable occupancy advance is considered to be a loan. Except even this gives no taxable income. This is because value coming in is compared to expected value going out. And of course THEY ARE THE SAME AMOUNT! So nowt to bring in as income. Fixing this gap it would involve imputing some form of interest benefit that was in lieu of rent. But what interest rate to use? What is the term? And then there is the whole thing that no one actually sees it as a lease agreement. Everyone sees it as ‘ownership’ with a guaranteed sale price back. Also entirely possible that what I consider to be blindingly obvious; cleverer people than me may consider to be – well – wrong. Then we get to much more old school techniques interest deductions to earn capital gains. And here Ryman seems to capitalise interest into new builds – section e of Significant Accounting Policies – rather than expense it for accounting. So there will be whole bunch of interest expense that isn’t in the P&L that will be on the tax return. And finally thanks to NZ IRFS 13 – really does roll off the tongue doesn’t it – their accounting profits note 7 include a bunch of revaluations on their investment properties which I am guessing is the apartments. Bugg€r with this is that even a realised capital gains tax wouldn’t touch this and doesn’t look like these guys sell. Gareth’s thing though would work a treat as all the unrealised gains are on the balance sheet. So here we have a property business that gets interest deductions; doesn’t pay tax on its capital gains or its imputed rent. Gains go on the P&L but not the interest expense. All while being totally compliant with tax and accounting. No wonder they are share market darlings. Thinking about the occupancy advances some more – depending on the counterfactual – maybe the value is in the tax system already as a reduced interest deduction. The properties need funding somehow. Usually the options are debt which generates a deductible interest payment; equity which is subject to imputation or a combination of both. Here the assets are partially funded by the interest free occupancy advance. If the residents just paid rent – the assets would then need more capital. This could be completely debt funded which would mostly offset the rental income. May even exceed it if there was an expectation of a large capital gain. 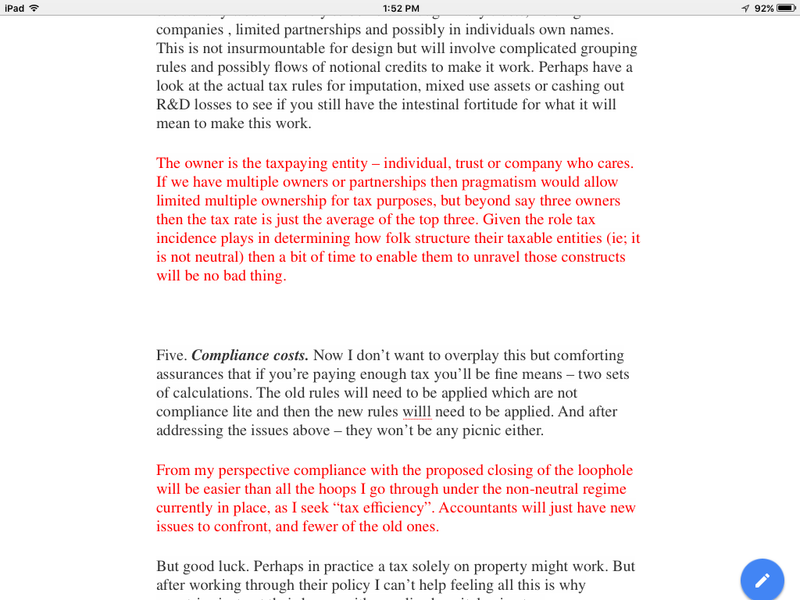 So while the occupancy advance is not in the tax system; neither is the extra interest deduction. 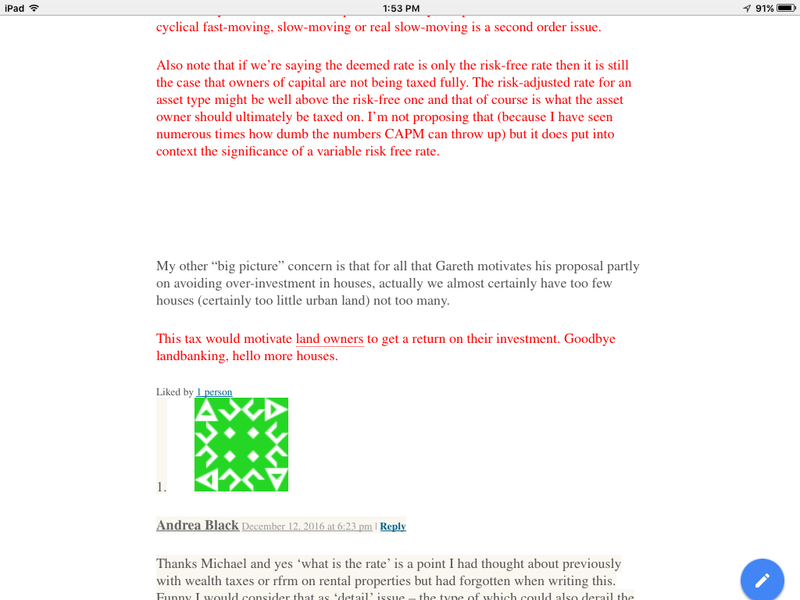 So maybe it is all an old school interest deduction for untaxed capital gain thing. But one for which a realised CGT would be useless as they don’t sell. May need to look at Gareth’s thing again. I wouldn’t normally create an entire post for a commentator. But hey it is my blog and not everyone is dedicating themselves to overhauling our country in a socially progressive way. Also I did devote an entire post to them so only seems ‘fair’ – as much as I dislike that term – to do the same for the response. There must be a technologically prettier way to reproduce his comments – but until number one son comes home for Xmas – this is the best I can do. 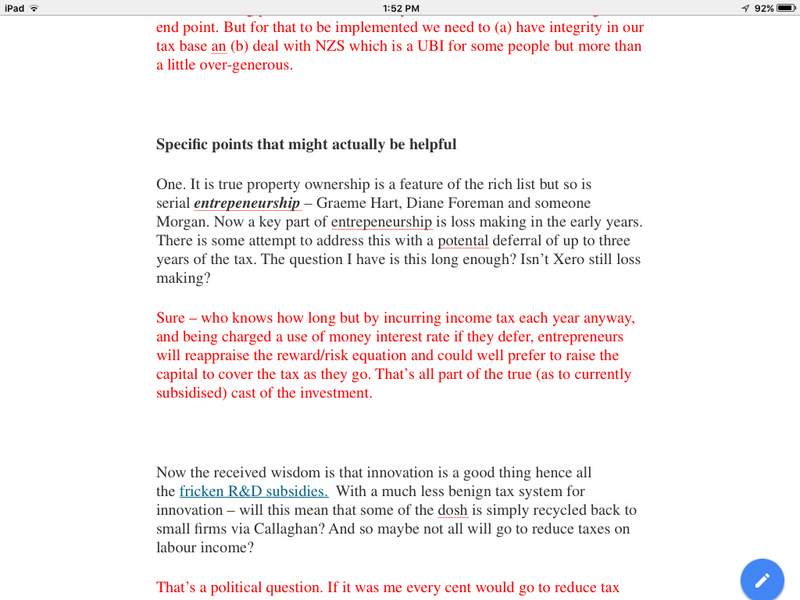 Or more particularly let’s talk about the recently announced tax policy of The Oppportunities Party – TOP. They are proposing to impose a tax on a deemed or imputed return on capital to the extent tax of that level is not paid already. Kinda like a minimum tax. With proceeds going to fund income tax reductions on labour income. TOP is a party set up by millionaire businessman and commentator Gareth Morgan to change the political discourse in New Zealand. Your correspondent is particularly fascinated as her eighteen year old self voted for a party set up by a millionaire businessman and commentator Bob Jones who set out to change the political discourse in New Zealand. I was righty then and lefty now and both parties were set up to scratch itches on the body politick. Bob Jones got no seats but he did get 20% of the vote. Today that would be almost the Greens and New Zealand First level of representation. Now the New Zealand Party never really got into policy much beyond Freedom and Prosperity. TOP however is much geekier and actually plans to release policy ahead of even deciding to register. And their first released policy is one on tax. And and it seeks to tax capital more heavily and lessen the tax on labour. Woohoo. Speak to me baby. Now New Zealand’s tax system is one designed by economists, drafted by lawyers and administered by accountants – so what could possibly go wrong. Nonetheless all three groups have their own languages and blind spots. It is a marriage that mostly works but only if all three groups keep their eye on the policy development and respect each other’s strengths. Another perspective is that of the high level ‘strategic’ people versus the detail people. Again each have their strengths but also the ability to talk past and frustrate the snot out of each other. Working at Treasury I was surrounded by the former. To the younger members of this cohort I would always consul them to stay with the process – even when it became boring. As because detail people speak last – they speak best. And what eventuates may not be what the high level strategic people with the higher number of hay points actually had in mind. In tax a classic example is the Portfolio Investment Entities rules. If you look at the early high level papers it was all about taking away the tax barriers to diversified pooled investment in shares. What we ended up with was the ability to have cash PIEs, land PIEs and single equity investments. Giving us almost a nordic tax system with the taxation of savings. So somewhere the high level strategic people disengaged or conceded to technical design issues that gave some unintended and quite important consequences. General aka random irrelevant points that say more about the reviewer than the reviewee. One. 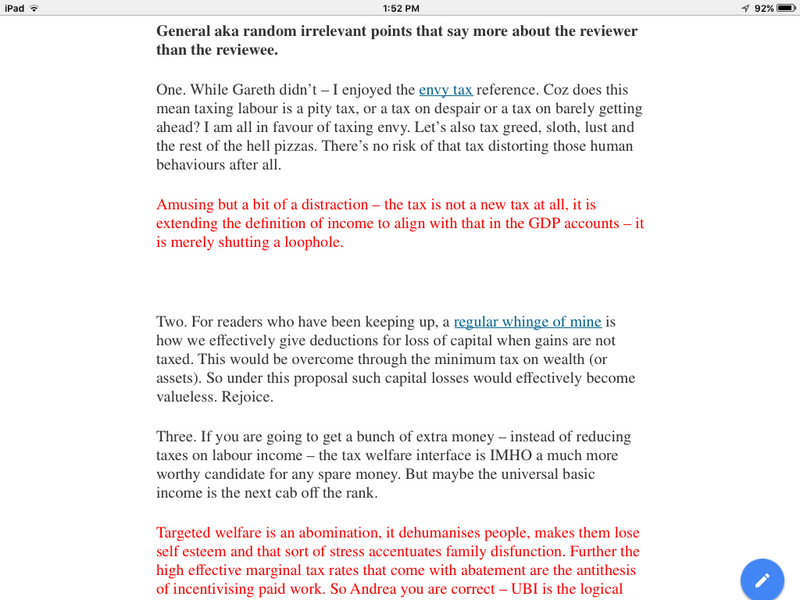 While Gareth didn’t – I enjoyed the envy tax reference. Coz does this mean taxing labour is a pity tax, or a tax on despair or a tax on barely getting ahead? I am all in favour of taxing envy. Let’s also tax greed, sloth, lust and the rest of the hell pizzas. There’s no risk of that tax distorting those human behaviours after all. Two. For readers who have been keeping up, a regular whinge of mine is how we effectively give deductions for loss of capital when gains are not taxed. This would be overcome through the minimum tax on wealth (or assets). So under this proposal such capital losses would effectively become valueless. Rejoice. Three. If you are going to get a bunch of extra money – instead of reducing taxes on labour income – the tax welfare interface is IMHO a much more worthy candidate for any spare money. But maybe the universal basic income is the next cab off the rank. One. It is true property ownership is a feature of the rich list but so is serial entrepeneurship – Graeme Hart, Diane Foreman and someone Morgan. Now a key part of entrepeneurship is loss making in the early years. There is some attempt to address this with a potental deferral of up to three years of the tax. The question I have is this long enough? Isn’t Xero still loss making? Now the received wisdom is that innovation is a good thing hence all the fricken R&D subsidies. With a much less benign tax system for innovation – will this mean that some of the dosh is simply recycled back to small firms via Callaghan? And so maybe not all will go to reduce taxes on labour income? Two. Is it a tax based on wealth or assets? Both are mentioned in the proposal but they aren’t the same. Capital is used a lot in the proposal and depending on whether you are talking to an accountant or an economist can mean either assets or wealth. But here is why it matters. Assets is the total of all the stuff you have legal title to, wealth is the amount that no one else has claims on. And the difference between the two is usually debt but could also be trade creditors, intercompany advances or provisons or accruals. Not all of these generate tax deductions. So if it is a tax on assets, is it fair to tax people on stuff that other have claims on? I doubt it. A bit of language tightening here would be cool. Three. Valuation. For property and things like shares market valuations are not too hard. Businesses – however – wow. There will be what the financial accounts say but then there will be what someone is prepared to pay. Usually some multiple of Earnings Before Interest and Tax – EBIT. And what about valuing implicit parental guarantees from non- residents. The choice then is to be completely fair between all forms of wealth and be a bit arbitrary and compliance cost heavy or not but not tax all forms of wealth evenly. Up to you. Four. Who owns the wealth? 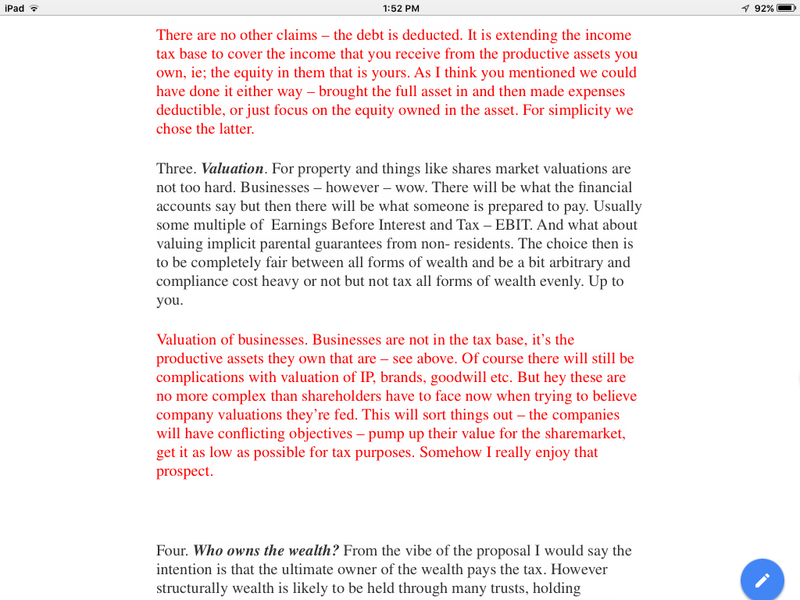 From the vibe of the proposal I would say the intention is that the ultimate owner of the wealth pays the tax. However structurally wealth is likely to be held through many trusts, holding companies , limited partnerships and possibly in individuals own names. This is not insurmountable for design but will involve complicated grouping rules and possibly flows of notional credits to make it work. Perhaps have a look at the actual tax rules for imputation, mixed use assets or cashing out R&D losses to see if you still have the intestinal fortitude for what it will mean to make this work. Five. Compliance costs. Now I don’t want to overplay this but comforting assurances that if you’re paying enough tax you’ll be fine means – two sets of calculations. The old rules will need to be applied which are not compliance lite and then the new rules willl need to be applied. 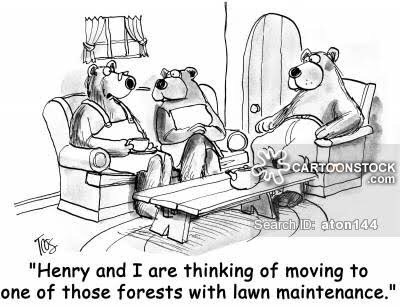 And after addressing the issues above – they won’t be any picnic either. But good luck. Perhaps in practice a tax solely on property might work. But after working through their policy I can’t help feeling all this is why countries just cut their losses with a realised capital gains tax. And thanks for playing. 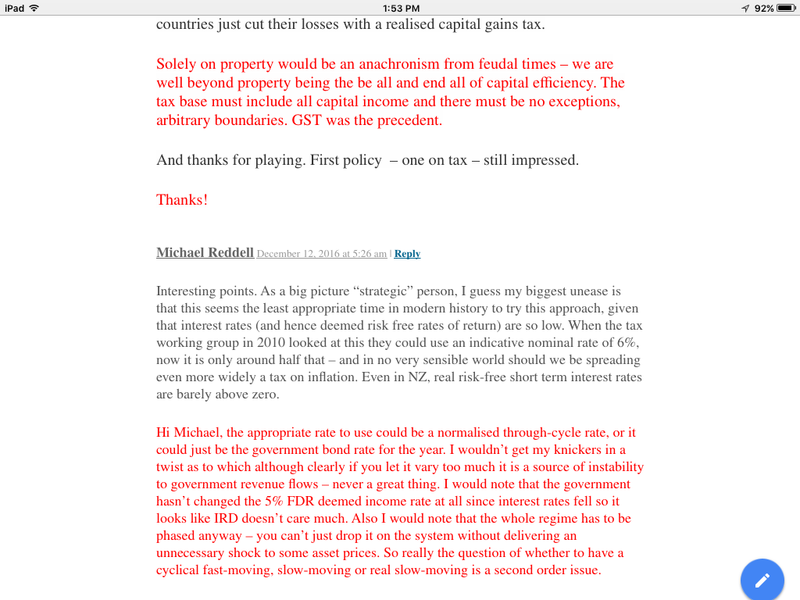 First policy – one on tax – still impressed.